Every championship team needs a backbone, and in the case of the 2004 Red Sox, their backbone also happened to be their backstop. Long before catcher Jason Varitek shoved his mitt in the face of Yankees star Alex Rodriguez -- in essence telling the Evil Empire to "shove it" -- he was the unquestioned leader of this wild, but wildly effective, group. Varitek didn't rack up the most hits, drive in the most runs, or make the most money, but there was not a man in the Red Sox' clubhouse who didn't know that this was Jason Varitek's team. His leadership was not provided in sound bytes -- he left most of the interviews to Curt Schilling, Pedro Martinez, Kevin Millar, and even Manny Ramirez -- instead, he led by example, on the field. And never was that leadership more in evidence than on the afternoon of July 24, when, with the Red Sox trailing the Yankees by 9 1/2 games in the American League East, and coming off an 8-7 loss to New York the night before, Varitek took matters into his own hands -- or glove hand, that is. With the Sox trailing, 3-0, in the third inning, starter Bronson Arroyo hit Rodriguez on the left arm with a pitch. Rodriguez barked at Arroyo on his way to first base, at which point Varitek became involved, planting his 6-foot-2-inch, 230-pound frame between Rodriguez and the pitcher's mound. After an invitation from A-Rod to take the proceedings to the next level, Varitek did just that, stuffing his mitt into the kisser of the game's highest-paid player. A wrestling match ensued, with both benches being cleared. After order was restored, one of the most compelling games of the season played out. It ended when Bill Mueller took Yankees ubercloser Mariano Rivera into the Sox' bullpen for a two-run homer in the ninth inning, giving Boston an 11-10 win, a result that many believed turned around the Sox' season. 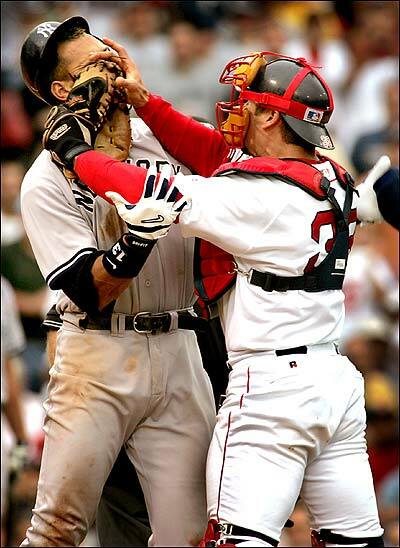 "Obviously, anybody who gets hit isn't too happy," said Varitek. "I told him in choice words to go to first base. Then things got out of hand." "I think it's going to take this rivalry to the next level," said Rodriguez. "The intensity is something I've never really seen before." But if Rodriguez had been watching Varitek all season, he would have seen that intensity daily. In addition to his usual stellar game-calling and handling of the pitching staff, Varitek hit .296 with 18 home runs and 73 RBIs, always seeming to come up big when it mattered most. In the postseason, it was no different. Varitek hit a tying two-run homer in the sixth inning of Game 2 of the Division Series against Angels, which the Sox went on to win, 8-3; he went 3 for 4 with an RBI single in the 4-2 victory over the Yankees in Game 6 of the American League Championship Series; and his two-run triple off Cardinals starter Matt Morris in Game 2 of the World Series got the Sox off and running to a 6-2 win. It seemed this season that whenever his teammates needed him, Varitek was there -- and it didn't go unnoticed. "Ladies and gentlemen," Schilling said after the Sox had swept the Cardinals, "here is the leader of the 2004 Boston Red Sox."